I use Sleep every night to turn off my iMac without shutting it down. But my iMac suffers from crashes after waking up from sleep constantly. Kernel Panics and the other processor crashes occurred after each time I woke up from sleeping. After researching and troubleshooting, I’ve come up with a couple tips to avoid crashes after waking up from sleeping. 1. 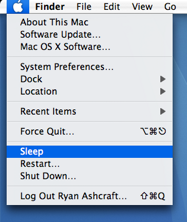 Instead of using the power button to start sleep, use the Apple menu and select “Sleep”. 2. Eject all removable media devices, such as USB flash drives and iPods before sleeping. 3. Quit all open applications before sleeping, if possible. The least amount of processes going on before you go to sleep is better. 4. Repair permissions with the Mac OS X Install DVD. These simple steps usually fix the issue that is common in Mac OS X. Hopefully Apple will eventually fix this issue, and we can sleep without following these steps. But until then, just follow these steps and keep from your Mac from crashing when waking up from sleep. Weird – I’ve never had crashes from sleep using any method on my G4 tower, iBook G3 or PowerBook G4, under any of the recent OS X versions. I expreince them frequently on my iMac G5, but never on my iBook G4. It is very strange, possibly a bug in the first generation models of iMac G5s.